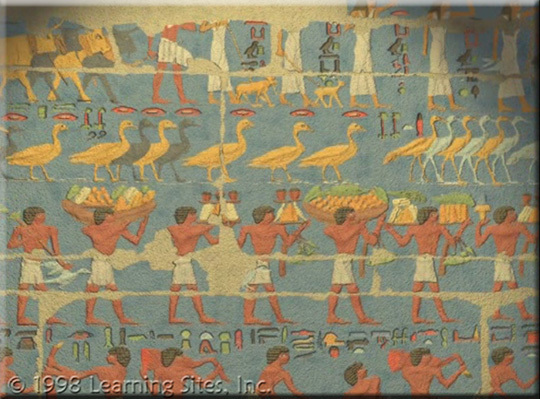 The following images are excerpted from one of LEARNING SITES' very first projects (1997-98)--an audiovisual museum presentation developed for the traveling exhibit: Searching for Ancient Egypt: art, architecture, and artifacts from the University of Pennsylvania Museum of Archaeology and Anthropology. The exhibit contained 138 objects from the museum's pre-eminent collection of Egyptian art. Among the objects traveling were the carved and inscribed false door and west wall from the Funerary Chapel of Ka(i)pura (a 5th or 6th Dynasty official of the Old Kingdom). 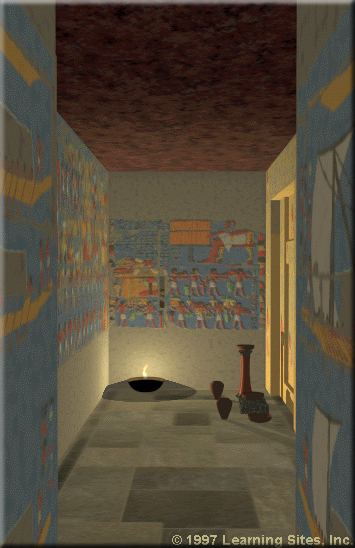 LEARNING SITES created a 3D model of the interior and exterior of the chapel and its context within the necropolis of Saqqara in preparation for a flyover and flythrough of the chapel, with accompanying narration and specially created digital music, all designed to complement the sections of the chapel on display. 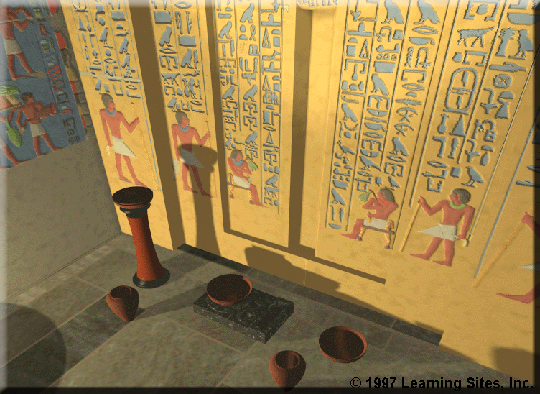 "The carved and painted decoration in the chapel appears to focus on two large seated figures of Ka(i)pura before a table, one on the west wall [to the right in the image at the left: view into the main chapel space toward the south wall and serdab, with the false door at the right; from our 3D computer model] and one on the south wall [straight ahead in the image at the left]; a standing figure of him occurs on the east wall. In each case, several horizontal rows depict offerings and bearers that would provide the many necessities that Ka(i)pura required for his afterlife...." (pp.170-74 in: Silverman, David, ed. 1997. Searching for Ancient Egypt: art, architecture, and artifacts, Dallas: Dallas Museum of Art). "The focus of the chapel room is the false door [detail rendering with offerings from our 3D model at the left], located on the west wall. The door represented the place where offerings would be made for the deceased. It was also the site where the spirit, which in theory could come up from the burial chamber and proceed forth from the inner niche, would take its sustenance. Several representations of Ka(i)pura, both standing and sitting, appear on the false door; texts are also carved on the architrave, lintel, and jambs. The inscriptions for the most part take the form of offering formulas that list funerary requests on behalf of the deceased. They also record Ka(i)pura's name and his many titles. Among these designations are several that center on the treasury: the overseer of the treasury, the overseer of the treasury of the residence, the undersupervisor of the treasury, and the inspector of the scribes of the treasury. Ka(i)pura also had offices associated with the royal linen and adornments. These titles and others indicate that he was a fairly high-ranking official...." (pp.170-74 in: Silverman, David, ed. 1997. Searching for Ancient Egypt: art, architecture, and artifacts, Dallas: Dallas Museum of Art). Sample views (below) from our 3D model of the chapel walls. The rendering on the left shows food being brought to the chapel for use in the afterlife. 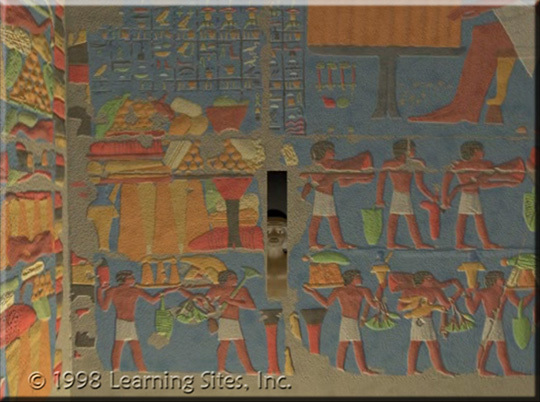 The image at the right shows the serdab wall, with the statue of Ka(i)pura inhabited by his ka seen behind the opening, and more food being brought in and laid out (a partial image of Ka(i)pura seated at his table can just be seen in the upper right). CAVEATS: The information contained in these images is in no way to be construed as an interim or final publication of the material. Data and images are not to be copied, retransmitted, or altered in any way without written permission from Learning Sites, Inc.; Dr. David P. Silverman, Curator-in-Charge, Egyptian Section, University of Pennsylvania Museum of Archaeology and Anthropology; and Debra Wittrup, Head of Exhibitions and Managing Editor, Dallas Museum of Art. » Digital Video Production: ProVision, Inc.